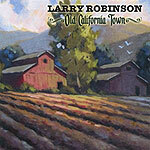 CD review: "Old California Town"
Anyone who ever wandered into the old Packing House (now J.J. Landers) on Main Street in Fallbrook on most any weekend in the 1990s must have wondered who on earth that singer was with the growling baritone leading his band through as tight a set of rock 'n' roll classics as you ever heard. Few sitting in a small-town steakhouse listening to Robinson play likely guessed that he grew up with rock royalty in the early 1960s before darn near hitting the big time himself in the late '60s with Things to Come, a combo that featured future rock legend Russ Kunkel on drums and that issued a couple of singles on Warner Bros. before disbanding. Robinson, a longtime Fallbrook icon, has finally issued his first solo album, more than four decades after beginning his career in music. In a different vein than his old Packing House shows, "Old California Town" is in the same acoustic country-rock-folk vein as Tom Russell or Dave Alvin's more recent releases. Best of all, the 11 songs on this release are on a par with those of Russell, Alvin and other top-notch composers (Guy Clark, Jimmie Dale Gilmore) in the roots/folk tradition. Robinson's style is relaxed yet upbeat, friendly and conversational. As with the other writers offered above as comparisons, he has a nice knack at writing seductive little melodic themes and then fleshing them out with intriguing arrangements. "Intoxicated On You" may be the loveliest song Robinson has yet written  Robinson singing the prettiest melody you ever heard in an utterly relaxed manner, with accompaniment by himself, Jeff Bowen and Tony Dean on acoustic guitars. "Japanese Camera" hearkens back to his rock 'n' roll spirit, while "Steinbeck's Ghost" is hauntingly beautiful. Given the musical riches to be found on this first solo album, here's hoping it doesn't take another 40 years for Robinson to make the next.